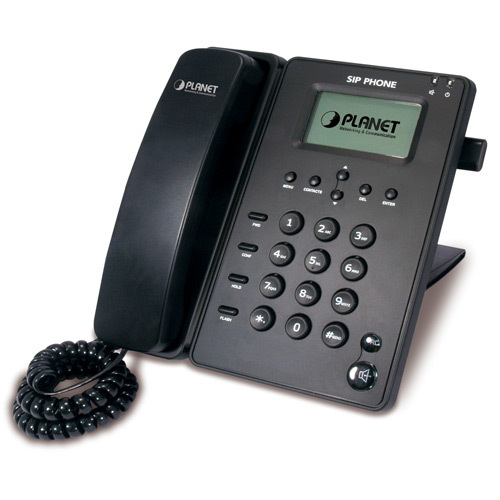 For a cost-effective and high performance VoIP communications today, PLANET has developed the VIP-254PT SIP PoE IP phone to fulfill the VoIP deployment needs of ITSPs, enterprises and homes. The VIP-254PT features high-quality speakerphone technology, and various voice services including an easy-to-use speaker on/off button and call hold / transfer / 3-way conference buttons. The VIP-254PT has additional features such as built-in PPPoE / DHCP clients, password-protected machine management, LCD menu display, speed-dial 3-way conference keys, hands-free speakerphone, last number redial, incoming message indicator, and user-intuitive web administration system. The VIP-254PT is the PoE IP phone featuring self-contained, service-integrated, intelligent phone features, and powerful voice processing. It can effortlessly deliver toll voice quality equivalent to the regular SIP Protocol connections by utilizing cutting-edge Quality of Service, echo cancellation, comfort noise generation (CNG) and voice compensation technology. Meanwhile, the dual Ethernet interfaces on the IP Phone allow users to install in an existing network location without interfering with desktop PC network connections. The VIP-254PT PoE SIP IP Phone is an ideal solution for office and home use as well as installation for Internet Telephony Service Provider (ITSP). It’s the delivery platform for IP voice services that brings benefits from the VoIP technologies in your daily life. 2009-07-30 1.0.2 Added: Watchdog feature can enable/disable on Telnet interface. 2010-10-14 1.3.0 Auto configuration files and tool.